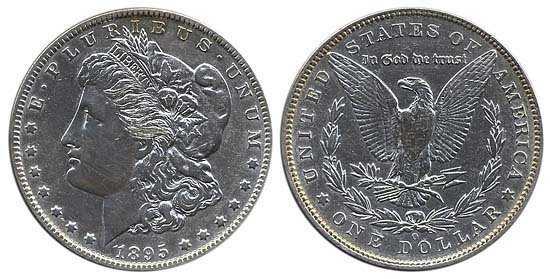 The Morgan Silver Dollar is considered the most widely collected and traded coin minted by the United States. Named for its British-born engraver, George T. Morgan (1845-1925), the Morgan Dollar was minted from 1878 to 1904 and once again in 1921. Total mintage was near 657 million. About half of all the Morgan Dollars have been melted down as silver bullion since 1918. Even with that taken into account, there are still approximately 275 million such coins in existence, so in terms of supply, there definitely isn’t a shortage. Reverse: eagle with wings standing upright holding arrows and olive branches, motto “United States of America” around the top edge, olive branches stretching under each wing under the eagle, “One Dollar” around bottom edge with one six-pointed star separating the mottos. 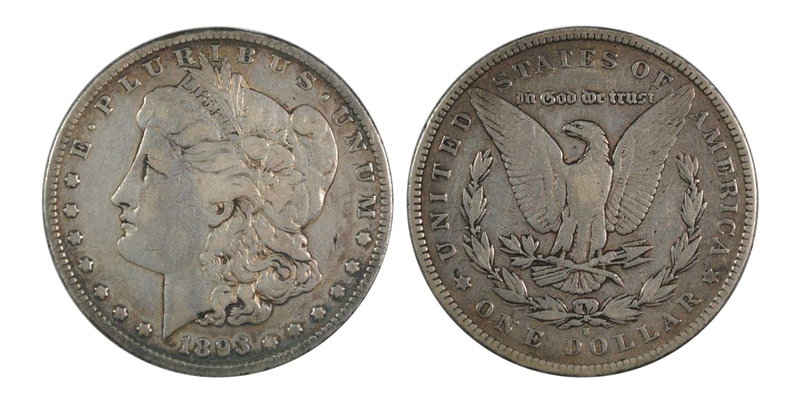 Most Morgan Silver Dollars are considered to be common at an uncirculated grade or Grade 50 or less because of the high mintage, particularly the 1921 Morgan Dollar, those minted at the San Francisco Mint of 1880-1882 and those minted at the Carson City Mint of 1882-1884 in grades up to 66. 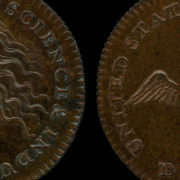 New Orleans minted coins are known to have been minted indifferently, with generally poor strikes. 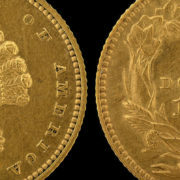 The 1878 mintage was made with different dies. The 1921 Morgan Silver Dollar is the most common U.S. silver dollar, with nearly 90 million minted at the Philadelphia, San Francisco and the Denver Mints. Image courtesy: LiveAuctioneers and Premier Auction House Inc.
Only one 1889-CC Morgan in its original GSA holder has been found to date. (The U.S. General Services Administration was responsible for sorting and marketing the U.S. Treasury’s hoard of silver dollars after the Treasury ceased issuing dollar coins. In a series of sales lasting from 1973 to 1980, this hoard of several million silver dollars, mostly Morgan Dollars minted at Carson City, was dispersed via auction and fixed prices in plastic holders with a black insert—today known as GSA holders.) 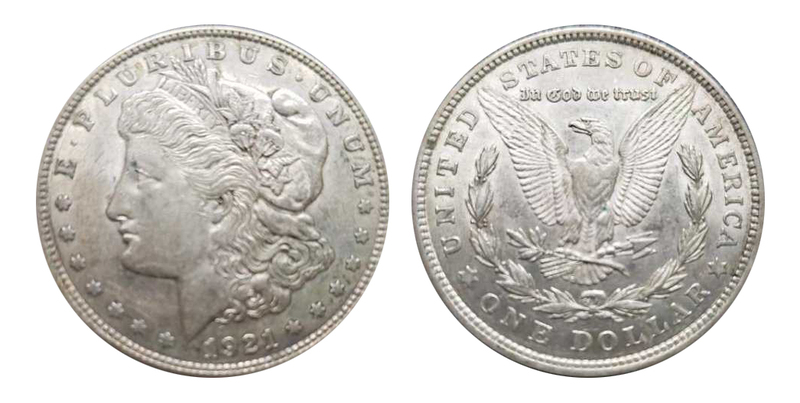 The 1895 Morgan Dollar, “The King of the Morgan Dollar,” exists only as a proof. Only about 100,000 1893-S Morgan silver dollars were originally minted, with an unknown number in existence [post meltdowns]. When taking a coin to a dealer or collector, do not clean it with solvents or scrub it. Just remove obvious loose dirt or grime. The date should be as clear as possible, since that will be the first thing that needs to be checked. If it is a precious metal coin (bullion), then the content will be tested and weighed to ensure it corresponds to the official percentage of metal as determined by the Mint and to ascertain whether the coin has a historical value or a melt value. If the coin is destined for melt value, each dealer will quote a percentage of the official spot price of the precious metal for that day, usually 90% or less. Next, condition will determine whether it is a collectible coin that can easily be resold. 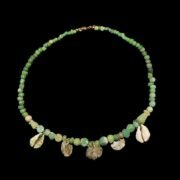 Coloring, normal wear from circulation, toning, “bag marks,” scratches and large marks will detract from the final value. The better the condition, the better the chances of the coin being bought. A grade will be assigned to the coin based on condition from 1 (poor) to 70 (uncirculated). The last step will be the mint mark, which indicates the U.S. Mint facility where the coin was minted. Certain mints are more collectible than others of the same type of coin, based on how many were minted in total from each mint. Any mint mark can add or detract from the final value. While examining the coin, the dealer/collector will be looking for any error marks that were added by the Mint accidentally during the minting process or any parts of the design that appear to be missing. That could affect the final value. The dealer will then look up how many were minted for circulation based on the mint mark and determine the demand for that particular coin from that particular mint. The final value will be determined as a percentage from an industry publication called the Grey Sheet, which updates the values of coins on a consistent basis (individuals can review the Red Book to get a sense of recent value). Each dealer/collector has a different value for each coin they buy. Condition: the overall quality of a coin as judged against others of its type. Key factors affecting condition include: the number of marks, abrasions, cuts and wear. The fewer the number of exceptions to condition, the higher the value is. 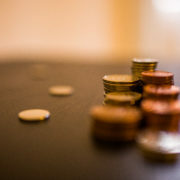 Demand: With any given coin, the more there are in circulation, the less interest there will be for collectors to add one to their collection or for dealers to add one to their inventory. Error marks are generally design flaws such as double strikes, chips, missing designs, wrong obverse or reverse, missing date, and anything that doesn’t belong. Grading: based on condition of the coin overall, grades are generally; 1 (P-poor), 2 (F-fair), 3 (AG-about good), 4-6 (G-good), 8-10 (VG-very good), 12-15 (F-fine), 20-35 (VF-very fine), 40-45 (XF of EF-extremely fine), 50-58 (AU-almost uncirculated), 60-70 (UNC-uncirculated). 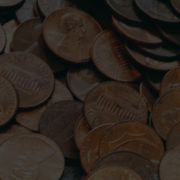 Commercial grading companies include Professional Coin Grading Service (www.pcgs.com) and Numismatic Guaranty Corp. (www.ngccoin.com). Grey Sheet (www.greysheet.com): an industry subscription service that updates coin values on a monthly basis. Historical value: a coin whose value is more collectible than the metal it contains. Melt value: For coins minted in precious metal such as silver, gold and platinum, it is possible that the mintage was so high that the value is more in the metal content than the historical value of the coin itself. This applies mostly to silver coins, but other precious-metal coins in poor condition might also qualify. Mint mark: The exact same coin may have a higher value than another similar coin if a particular official government mint produced a smaller quantity of them for circulation. 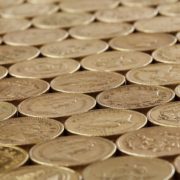 Mintage: the official quantity of coins released into circulation or as commemoratives; the lower the number, the more valuable the coin is to collectors. 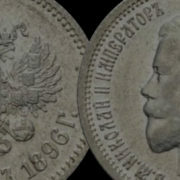 Obverse: the “heads” of the coin, usually is a profile of a historical figure or person. Red Book: a consumer publication known as A Guide Book of United States Coins by Whitman’s Publishing LLC that updates coin values on a yearly basis. Reeded edging: coin edging that has been ridged or milled when struck at this mint. Such features discourage slicing of edges to remove some of the precious metal.